Our first putter shoot out of 2009 is here and the manufacturer participation for this one was the best we have seen to date. With over 15 companies involved and 27 different putters tested we had a great time putting this together. You can read all about the putter entries and the participants involved in the testing here. 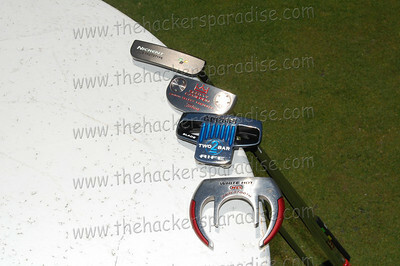 To make sure that this test was completely unbiased, none of the testers work for The Hackers Paradise or have any affiliation to the putter manufacturers either. They are strictly golfers that are in the area of Tampa, FL that volunteered their time for our cause. These are their views are not the views of The Hackers Paradise or our writers. Unlike our driver shoot outs we have done over the past few weeks, our putter shoot out has been conducted differently. Because of the amount of putters and companies involved, we will not be ranking the clubs one through 27, but rather give you the golfers thoughts on each putter line. Putters are far more personal than drivers and THP felt ranking them would not do each one justice. However I think you will find a trend in the results that cannot be denied with more players liking and disliking the same putters over and over again. We will also have some links at the conclusion to this review that you will not want to miss. 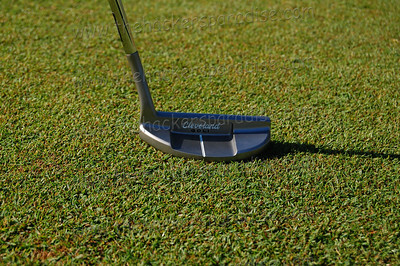 These will send you to our forums in which you will be able to see all the pictures from the putters involved as well as another write up that profiles each golfer that participated in this and what they played prior to the shoot out, what their favorite was that they tried, and even what their least favorite of the group was. Now let’s get on to the putters. The GEL Paul Hurrion line is the latest from GEL Putters and something that we expected to fare quite well in this shoot out. Here is what we were hearing about the Sedo and the Scindo. Tim B – I play a Rife and I expected to like this one but it really lacks any feel and the face seems too hard to me. Very disappointed because I liked the looks of it. Brad D – Horrible. How can anybody put with something when you cannot feel the ball coming off the face. David B – I got the ball rolling with both of these and liked the Sedo inside of 10 feet, but anything over 15 feet was impossible to judge. What a shame. Overall less than 4 people had positives to say about the GEL Paul Hurrion line nobody had it as their top choices in either looks or performance and I have to say we were a bit surprised. 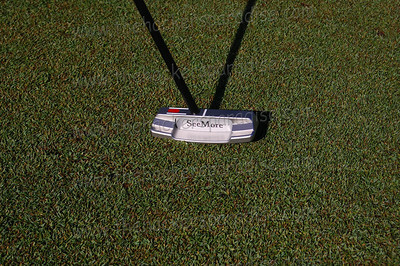 Not one of our entire group of testers had ever tried a SeeMore putter, but I believe that this may have changed things for them. SeeMore was one of the most well liked out of the entire group. Here are some of the quotes we heard. Dave L – It took me a little bit to get used to the red dot, but man these things just work. 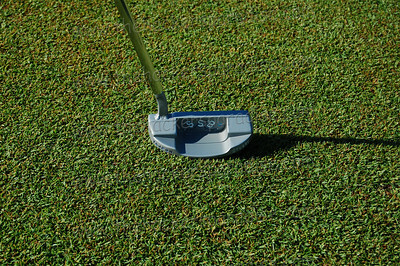 Steve F – Softest putters by far in the entire group in my mind. This will be my next purchase, even without the aiming thing, they are great. Add that, and you have a winner. Al G – The red dot thing just works. More than anything else, the putter looked right and felt right. Quite a few picked a SeeMore as their favorite putter of the shoot out and most of the 18 golfers involved had good things to say about them. Definitely fared extremely well today and made some believers out of people. We had both a mallet and blade from Taylormade. The mallet is a prototype from the Monza Spider family and the blade is a Rossa TP. Two very different putters. Jason B – Kia Ma makes the nicest putters I have ever seen. Amazing thing is that it worked better than it looked. Rick K – That Kia Ma is simply gorgeous. The mallet was different. I liked the way the ball came off the face, but had trouble leaving the ball short with it. Bill F – I liked both of these but for different reasons. The blade really worked well from all places and was super soft. One of the softest out here. The mallet was automatic inside of 8 feet, it felt like cheating. 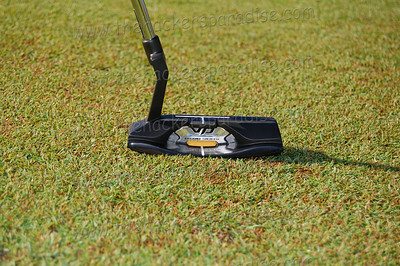 Overall the Rossa TP Kia Ma was one of the most well liked putters for looks in the entire field. Most of the group had it in their top 3 for aesthetics out of everything. The mallet prototype fared differently. It seems as if people either loved it or hated it. Very polarizing, but those who liked it wanted it badly. One of our smaller custom putter companies that we had the pleasure of reviewing a few months back. We expected rave reviews but that is not what we got. We got about a 50/50 split on what people thought. Tim M – The head is way too small and the finish reminds me of an old mini golf putter. Steve F – Loved the hosel and this thing is seriously soft. Much softer than my Scotty I use. Larry B – Not forgiving at all and much too small. Something just did not look right at all on this one. Like we said earlier, this one was not what we expected. Only 2 golfers had the Sunset Beach in their top 5 and nobody had it in their top 3. Feel wise it did quite well, however too many people struggled with the head shape on this one. We have not reviewed these and really had no idea what to expect other than when we first got them, they look fabulous. Tim M – Played a Scotty my entire golfing life but I am switching to the BC3. Loved everything about it. Looks, feel, and performance. Liked both of the Mizunos a lot. Mark J – I really liked the BC6. I putted better with a few others, but this one just sets up perfectly for me. One of the softest out here today. Matt K – I do not like how it looks like an insert when there isn’t one, but these putters just work. Overall these were in just about every golfers’ top 5. Both in looks and performance. Just an all around great performer and aesthetically one of the best we have seen. Another performer that not one single tester had ever tried. If the shoot out was based on looks alone, these would have done really well. It turned out that they performed better than they looked. Dave L – This mallet is just awesome. But I must say that the blade being only $99 is one of the best bargains out here. Striking putter. Brad D – This and the Nike mallets had me. I loved both of them a lot. Never heard of this one before but the black and gold looks good. David B – This 385 feels really good. Nice coming off the face and overall it worked really well. I liked the looks of the mallet too, but the blade is awesome. Another putter line that really did well here. Lots of people really liked the black color and the price of the 385 blade makes it a true contender anytime out. Simply put EVERYBODY liked the looks of this one. A clear cut top five in looks that was for sure. Most had not heard of them and everybody wanted to hear more. 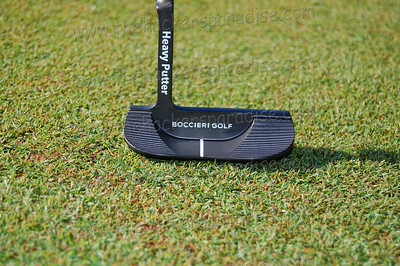 Rick O – I have never seen a putter that looks as good as this one. Super soft coming off the face and just pulling it out of the bag gives you confidence. Chris W – All I can say is oh my God. These are great looking. I struggled a bit with the size of them at address but they are super soft and just gorgeous. 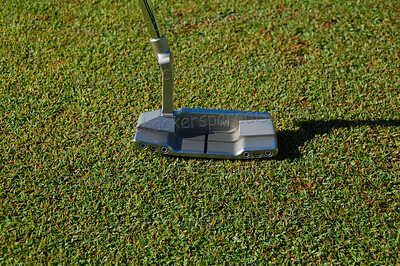 Larry B – Best looking putters out here. I have said that a few times today, but these really are. I would have liked a slightly smaller blade but they are super soft. These dazzled in looks as we said and everybody remarked on how soft they were. In the end, the were at or near the top in looks and in the top 10 for performance as well. Plus they do full customization so people can really do what they wish with them. These did NOT do well here. Neither in looks or performance. Not one person had them higher than last in performance and in looks we had a few that liked them based on nostalgia, but not one golfer said they would put them in their bag permanently. Rick O – How could anybody putt with that tree thing? It feels weird and looks weirder. Al G – How is anybody supposed to putt with that piece of bark. I would like it in my office, but outside that forget it. Jim H – Not sure how anybody could putt with that old wooden one. It feels as if every part of it is wrong. Not a whole lot more we can say about this one other than we had the same thoughts in the review we did on it a month or two ago. The XRAY mallet ended up being the real surprise of the entire group. Not too many people actually liked the blade which surprised us, but the mallet was LOVED by almost everybody. Larry B – I didn’t want to like the XRAY, but it worked for me really well. The two lines make it easy to lineup and putt with it. I really liked the putter with the red dot too. Both of those seem to work the best for me. I also really liked the sound that the XRAY made. Rick O – The alignment tool on the XRAY mallet is the best I have seen to date and I just felt better with it than anything else. Rick K – That XRAY putters are the best Never Compromise has come up with in years and it really worked. Really liked the blade but just love the way both feel and sound. These came in just a day before the shoot out started so we never even got a chance to try them ourselves. But the testers let us know that they work very well. Another putter that had totally different opinions on both sides. Some loved it and many hated it. Dave C – The ball comes off the face really nice and I must say the shape keeps you on the right path. Rob C – It has the best ball picker upper, which is good because I could not hit the broad side of a barn with it. Bill F – Thought I would hate it, but ended up liking the performance a lot. The looks just did nothing for me though. More than half the people testing putted quite well with this one, but a lot of people struggled with the looks. If the looks work for you, then it is one to try out. 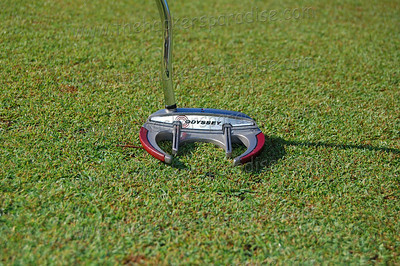 Another putter that I think performers were eager to test out and it did not disappoint. 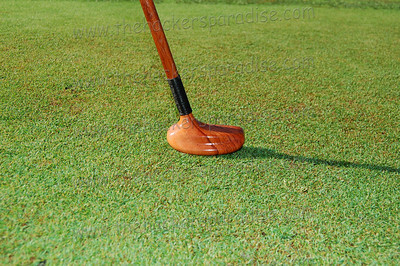 The ball rolled tremendously well for people and players were able to compare this and another “grooved putter” and see which one they like best. Jim H – I have used a Yes! Tracy for a while now and will be switching to the Rife. It feels softer than my putter and definitely softer than the GEL I tried earlier. Great putter. 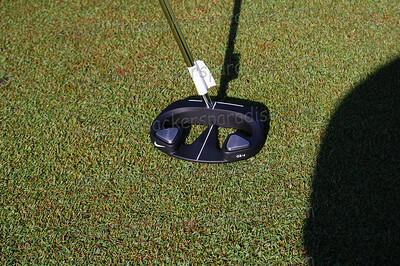 Mark J – I made a lot of putts with this one and the ball rolls super smooth coming off the face. This was one of the best for me for longer putts. Tim B – Tried the mallet a while back after the commercial on TV and did not like it too much, but liked this one a lot. Just need a few tweaks in the looks department. A performer that certainly finished in our top 5 in performance. 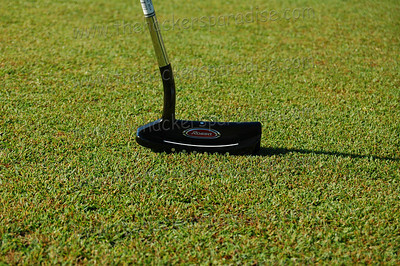 One thing to note here is that not one person considered this putter a blade but more of a mallet. Well liked either way. A puzzler for sure. Many gravitated to it at the beginning but most immediately found that they did not care for the looks too much. Performance did not fare well either. 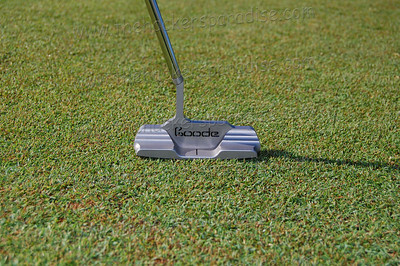 Dave C – You have a milled putter with a simple look and you expect soft. Not something that is hard as a rock when putting. The ball just skidded off the face too. Mark J – The Goode felt heavy and weird. I felt like it should have cleaner lines. 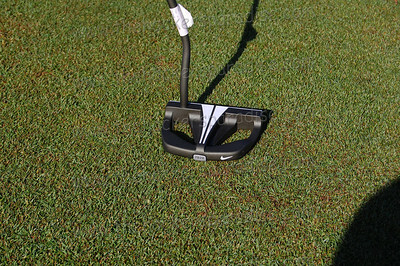 Bill F – We have tried some great looking and great performing putters here and this fit neither of those categories. We expected a few more to like this one but in the end not one golfer had it in the top 10 in either performance or looks. 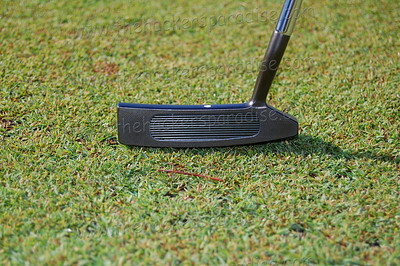 Another one of those putters that about half of the group loved and the other half hated. But the looks of this one most of the group liked a lot. Tim B – I found myself in perfect balance as I used this one. Never putted like that before in my life. Loved the look of it too. Bill F – Really putted well with this one. Not sure going in that I was going to like it, but it flat out works. Matt K – This thing just does not work for me. I put every single putt way past the hole. Terrible. We found more that liked that than did not like it, but still polarizing results. Quite a few of our golfers were using Scotty Cameron putters when they went into this shootout. Not one was using the Fastback though. Rob C – With a Scotty you know what you are getting. Soft feel and a good all around putter. Surprised it was not the softest out there though. Steve F – I love my SC, but did not care for this one. It felt slightly harder than I am used to. It also could be that I tried it right after the SeeMore though. 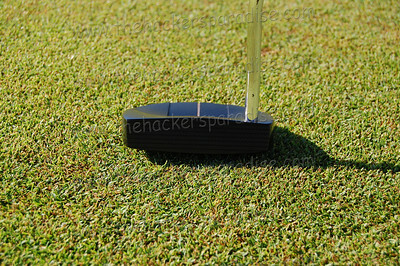 Jim H – Loved this putter. Solid performer and a great look. We were surprised that this one did not finish in the top 5 in either looks or performance. Although it was right outside the top 5 in looks. We expected this one to do quite well and it delivered however like the Scotty was outside of the top 5 in both categories. David B – The look of the milled putters with the gun metal finish and the grooves of the Rife and GEL and you get the Nickent. Perfect combo and the results make me want to abandon my White Hot. 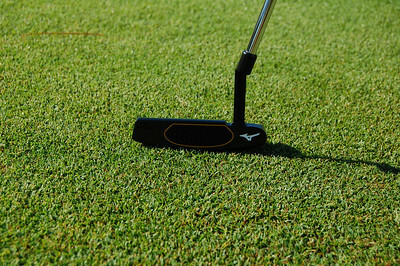 Chris W – The putter looks great and rolls the ball really well, but it lacked a little bit of feel for me. Al G – Middle of the pack for me. Nothing wrong with it at all. Look and performance were good, but too many great ones in here. Both looks and performance had a top 10 finish but only one golfer had it in their top 3. 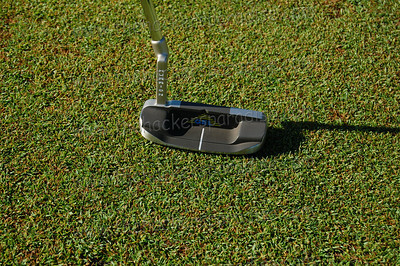 A putter that the golfers gravitated to on the simplistic looks of it. It performed quite well but the looks were what brought people to it. 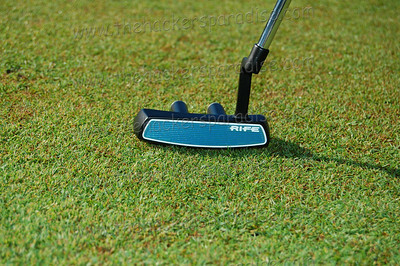 Rick K – Nice looking putter and some great feel. When I found out the price I almost fell over. Cheapest putter here and it works like an expensive one. Jason B – I am a mallet guy but I would be lying if I said I did not fall for this one based on price and looks though. Great putter. Jim M – This one did not work for me no matter how bad I loved the price and the way it was simple. Really struggled with the longer putts with it gauging speed. It was a middle of the pack putter but when people found out the price they gravitated towards it instantly. For the money it was one of our best buys. This was one of those putter companies that we really felt was going to excel here and people putted very well with them. Looks were an issue for quite a few though. Rob C – I putted okay with these but I felt as though they were busy looking for no other reason than to make them busy looking. Just did not work for me. Mark J – I really liked the blade version of this line but the mallet just did not work for me. Not my cup of tea I guess. Al G – I made almost every putt with the mallet and a lot with the blade. These were near the top for me. Very strong putter. Rolls the ball will. Did not do well enough to make it into the top 5 but most really putted well with them. We got quite a few comments about people saying that they were “too busy” looking. From looks alone many of the golfers here had a tough time with this one. They just did not really like the green face. Jason B – Loved the shape but the face left a little to be desired. It felt soft but not soft enough to me. Brad D – I did not like this one at all. Nothing from this worked for me. I actually was really looking forward to trying it out as well. Dave L – I liked the OZ quite a bit. Nice soft feeling off the face and loved the looks of it. It seems that the people that did not like the looks did not putt well with it and the people that were okay with the looks liked the performance. Great ball scooper. We did not know what to expect about these because going in we had never tried them. But most of the golfers really liked them. Brad D – The mallet was one of my favorites out here. 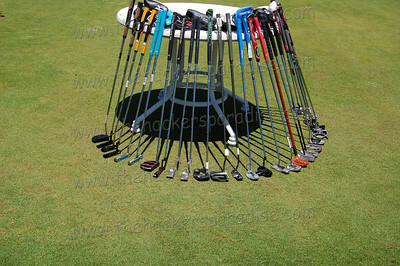 This was only one or two of the putters here that I would change out for in a minute. Rick O – Both of these worked really well. Ball rolls great coming off the face and the looks are really solid. Would like a little more feel. David B – I didn’t want to like it, but the mallet really worked well for me. It keeps you in your stroke and I found myself correcting any misses I had. One of the few lines where the mallet and blade did equally well. Very few really disliked these and most really liked them. Left just outside the top 5 in performance and would have been higher had 2 players not had them dead last. Now that we have gone through the above let’s get the rankings. Before we do that though, here are a couple of things to check out for more information. If you would like to read more about the people testing each club and what their favorites and ones they liked the least, check out Participant Thoughts. 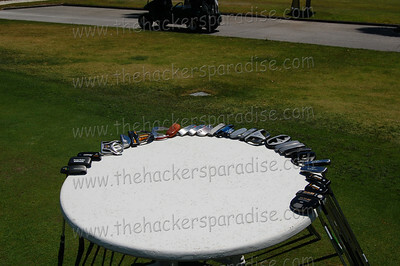 And of course do not forget to check out all of our putter shoot out pictures. You can see all the group photos here and all the putter close ups here. Now on to the rankings. We asked each participant to rank their top 5 putters based on looks and then we recorded each golfer and performance with each putter. To explain more here is how the testing of performance was done. There were 4 stations with each putter setup. Each station had a hole and 4 balls at it setup at 5 feet, 10 feet, 15 feet, and 25 feet. After completing the stations golfers were allowed to continue putting with each putter for their own benefit. 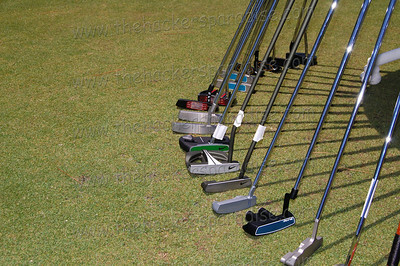 Every golfer that participated had to try out EVERY putter at each and every station. It was a long process but we think the results were worth it in the end. Now finally the moment you have been waiting for. The rankings for both looks and performance. Overall, you can see by all that has gone into this that putters are different for everyone however we saw a trend with these where the same putters were doing well in performance no matter who had them in their hands. It was quite surprising and in the end a whole lot of fun. Just about every putter here did well in different people’s hands and in the end it is finding one that is right for you. We know quite a few of our participants will be changing to things they never thought of. We want to thank each and every company that participated in this and we look forward to doing it again in the future. This was extremely surprising to see a website go through all the trouble of putting this together. The time it took for the shoot out by itself must have been days. Great work. After trying a number of different putters, I changed to a Mizuno Bettinardi BC1 and have never looked back. No question, a great putter. Thanks Mizuno and Bob Bettinardi. So glad I found this site. Never heard of most of these putters but now I want to try them all. That link to all the pictures was very cool. Oh my word this is pretty cool. 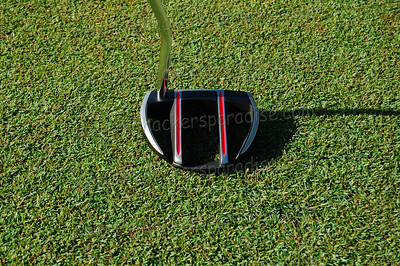 Never heard of Machine putters, but i am on their site right now looking. Very cool. This was extremely thorough. Best I have read to date. I enjoyed the read, and it was good to see some of my favorites do so well. Looks like the Never Compromise X-Ray Mallet took the prize in this shootout with the SeeMore M2 right behind it. Great wrap-up on the shootout. I need to spend more time on the thread with everyone’s comments. Good job. So I just finished reading the entire thing as well as the stuff in the message board. That was very long. But really well thought out and some of the best material I have read in a long time on putters. thank you for putting that together. Thanks for all the kind words guys. This was a big project but something we have wanted to do for a while. Reviews by a single person are great but real world trial and error seems to benefit the consumers a lot more. In the end it cuts through all the marketing that is out there and really showcases what worked for this group of people. I have been waiting weeks for this and I was very curious as to how some of these putters would do against the bigger names. Turns out pretty good. Will you guys be doing anything like this for the female readers that you have? We hope to be able to do that very thing. However with putters we found most of them suitable for men or women. Great, if I wasn’t so satisfied with my current putter – I’d go after a SeeMore. Great shoot-out THP. Interesting results on some of these, but I’m glad to hear the mizuno did well, since I just picked up a used Bettinardi myself! Also, I have got to get my hands on a lefty SeeMore to see what all the buzz is about. This is way cool. Never seen anythign like it before and think it should be done more often. I use a Seemore and think it is the best out. Excellent idea, process and end product. This was a good read and I was not at all suprised about the SeeMore.. they are some of the best putter I have tried. I am also interesed in trying the NC XRAY now b/c it just intrigues me. This was a great cross section of the sticks on the market and something for most golfers. Thanks for the effort to THP folks and those testing the clubs. Watch out GD…THP is right on your tail. This is fricking huge. What a great report. It took me a whole day to read through all of it and was worth it. I really want to try an X-ray now. You guys put the hot list to shame. This was iconic. This must have taken a whole lot of time. I found this review via google and I must say that I am glad i did. I use the Scotty that was featured here and really like it. Good job. May inform my next putter choice. Unless the Odyssey i have at the moment starts working again! All that work and not a single Yes! putter was tested? Why? What did Stenson win with this week? Oh yeah, a Yes! putter. PS–the Yes! Nicky is gorgeous! YES! putters was invited to participate and declined. Great shoot out write up THP. Very cool that all of the companies agreed to have their putters in it. Im suprised the SC fastback didnt do better. I just recently purchased a hamilton mallet putter on ebay and am hooked! Great looking club, great alignment and most importantly great feel! It’s kind of an off brand but it got it’s first win on the Champions tour……..I’ve used it for three rounds and love the way it rolls the ball…. This is the kind of info I have been looking for! Thanks so much for doing this testing the way you did it. No prejudices, just opinions from a variety of random golfers. Now I have a list of putters to try out against my Bobby Grace Lakewood putter, my favorite so far as of last year. Very cool site, bookmarked! Your reviews are awesome. I really appreaciate the non-biased comparisons from a range of different handicapped players. I have used your equipment reviews for my last two purchases (hybrid 3 iron and now a putter), and your reviews are right on. In researching what I should try out for a new putter, I see that the Never Compromise XRAY mallet putter is in the 2010 Hot List as well as in your top 5. I have gone and tried out alot of putters, and this club is great. I have not bought a new putter in 15 years, but I tried this one and absolutely loved it. I bought the NCX Ray Sigma yesterday! I personally found the single alignment line (Sigma) easier to use than the dual line. But what a great product.